Pyramid Diffuser Panel are made of high density glass fibre designed to provide scattered reflections for a diffused sound field. Pyramid panels break up flutter echo from flat surfaces to enhance music tone quality and speech intelligibility. 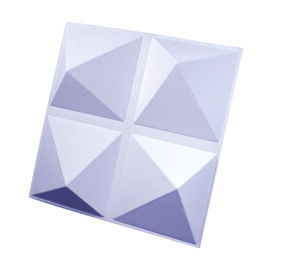 Pyramid Diffuser Panel is designed to fit into standard suspended ceiling grid or can be fixed to walls with brackets. Ideal for music rooms, performance halls, theatres where speech intelligibility and music tone quality is desirable. Manufactured from high density alpha plaster reinforced with glass fibres.. Deeply profiled asymmetric reflective shape. Helps create diffused sound field for music tone and speech clarity. Designed as a lay in ceiling tile or can be fixed to walls. Sound Absorption Rating: per ASTM C423, E-200 *est. All panels are demountable and accessible. Manufactured locally, product and packaging can be recycled. AS1530 pt 3. Smoke developed 1, spread of flame 0. Max 95% R/H at 30°C. Clean with vacuum, soft brush or damp cloth. Shall not commence until the building is water tight and dry. Lay panels into standard T24 two way exposed grid system with minimum of 200 mm plenum to allow for placement of panels, use hold down clips in seismic areas. Panels may be fixed to walls using brackets. Store panels on pallets in a clean dry place. © 2018 Acoustical Surfaces. – All Rights Reserved.